It has been brought to my attention that there has been some misunderstanding/miscommunication within the Chinese community regarding the recent translation efforts. There now appear to be two groups that wish to translate the game, but there seems to be little to no communication between them. It has also been brought to my attention that the 'alternate' translation was partially based on a version of the original translation group's work without their consent. Until this matter is resolved, we have pulled the alternate translation from being available for download within the game. At the end of the day though, it is the Chinese community that suffers over squabbles and misunderstandings. I feel it is best for the community as a whole if the two groups discuss this matter and come to an understanding over the future of the Chinese translation. Frankly, pooling your resources seems like the wisest solution to me, but it is a matter I leave to you. If cooperation is for some reason not an option though and the issue over plagiarism is resolved or the alternate translation is made without reusing materials from another translation, then we will be happy to put it back as an option. I am kinda upset to type down these words due to the hurtful accusation. at #37 as early as in 09-13-2017 , please use Google Translation to verify what I said. But there's no reply or contact. Therefore I logically assumed the thread was dead, or who's in charge is unclear. The fact stays as it is even at this moment. You keep saying the other team. but unfortunately their information is only exclusive to you. We have no clue who they are individually. Another fact is before this DLC, there hadn't been any Chinese translation update since 1009. Just like situation with Otic, translators from old days appear no longer with the game / with the project any more. Yes, Otic knows who were doing translation, but he has confirmed he has no idea who's in charge of this one. Frankly solution in my mind is simple as this. We can download the original language pack, start it over with our own work, and re-present to you. Are you fine with this arrangement? Last edited by ABCbarbecue; 10-25-2017 at 04:22 PM. We received no reply from ABCbarbecue's PM to Rhis, nor from your thread of accepting translation applications, even no reply from the other translation group. Our approaches could be evidenced by the pics below. When DLC was released we notified that V1.020 R30 is incomplete, conversations with NPC in DLC was not even started. 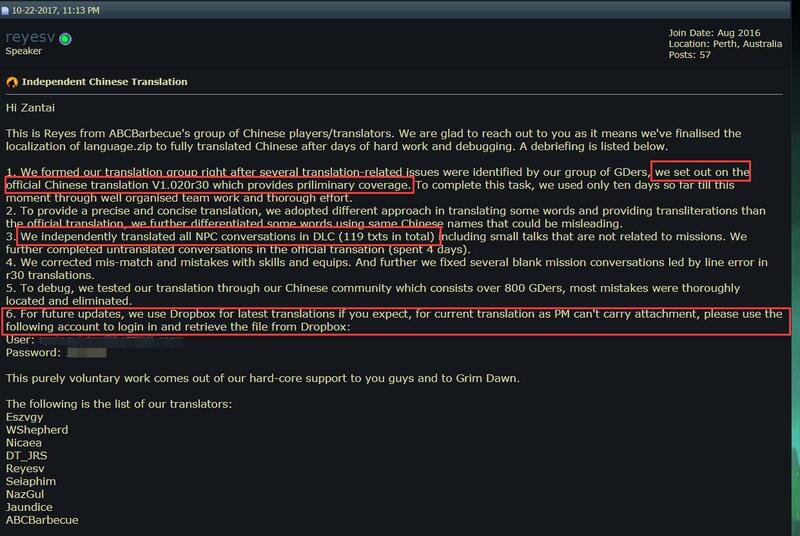 Considering for the good for our community and negative reviews in Steam Chinese section re gaming experience, we decided to contribute a great part of our spare time and finalize the translation based on R30 from the other group, just to assist. On Steam page Grim Dawn specifies that the game supports Chinese however the actual game did not come with an "official", complete and usable Chinese, this somewhat troubles players from our community. This is simple, we pointed out clearly in our initial PM to you that "we set out on the official Chinese translation V1.020r30 which provides priliminary coverage. ", we further clarified that "We independently translated all NPC conversations in DLC (119 txts in total)" in the same PM. Also we provided our zip file of translation for you to use directly and as a complement to R30 translation. What did we Plagiarize from the point of getting R30 to finishing our translation? We sent finished parts in R30 (the 119 texts) to you to complete what left untranslated in the other translation. We felt misunderstood and upset about the accusation of "Plagiarism" for contributing voluntarily. Maybe after reading the initial PM you should be the one who told us "this is not the way translation works, you should contact R30 authors and try to figure out a way around their copyright, or develop a purely one of your own". We had no idea how you guys run translation, when you authorize the access we naturally used that. If this involves the other group's efforts and copyright regarding R30 translation and they felt offended, we do sincerely apologize for that and offending is never our intention. We are still willing to assist the Crate and players from Chinese community. As we finally figured out how the translation works, we decided to start our own translation from the very beginning, exclude all translations and re-present to you. We finally get to understand the play rules that we are going to comply with, we will also reserve our copyright. Our original thought is to offer a complement to current R30 translation, plus to acquire the access to language set for next translation. However with this precious opportunity we would like to provide an entire set of translation apart from the other translation. Players' reviews will tell which team has higher profession. You are welcome to whichever solution you prefer. It doesn't matter to me. Translators put in a lot of their own time and I merely want to make sure earlier work is respected. When I'm getting angry PM's at 11 at night from other translators over this, we needed to take some action. If posting in their thread did not elicit a response, there are Private Messages...in any case, all this seems to be a matter of miscommunication. It doesn't matter to me how it is resolved, only that the Chinese community continues to benefit from the efforts of its members. We received no reply from ABCbarbecue's PM to Rhis, nor from your thread of accepting translation applications, even no reply from the other translation group. Our approaches could be evidenced by the pics below. When DLC was released we notified that V1.020 R30 is incomplete, conversations with NPC in DLC was not even started. Considering for the good for our community and negative reviews in Steam Chinese section re gaming experience, we decided to contribute a great part of our spare time and finalize the translation based on R30 from the other group, just to assist. And that's fine and all, but the players that put together R30 were not informed. On Steam page Grim Dawn specifies that the game supports Chinese however the actual game did not come with an "official", complete and usable Chinese, this somewhat troubles players from our community. Language options are listed on the store page at the request of translators, as an acknowledgement of their efforts. Saying that you used the other translation as a starting point is meaningless to me. It has zero bearing on the fact that you did not speak to the other group and have them be ok with starting with their work, which I have no way of knowing. I don't appreciate that you are laying the blame on me in this misunderstanding. My job is to make the game you play, not be a communicator between you and other players or to be a detective on whether everybody is playing nice with each other's work. All translations are submitted voluntarily by players who wish to improve the game for their respective community. This doesn't mean that the work of players who contributed before should not be respected. We appreciate all efforts that players put forward willingly to make the game better for their language. But we also want to make sure everybody's efforts are rightfully acknowledged. Rhis created a means for players to translate the game to their native language and upload their translations directly to be downloaded from the game itself as a courtesy to international communities. Otherwise the game would have remained 100% in English. In any case, explaining yourselves to me is pointless as I don't need apologizing to or blaming. I just want to see the misunderstanding resolved and the Chinese players provided with the best that their community puts together. Now we had the talk. Let's scratch this chaotic miscommunication issue and move forward. We fully respect intellectual copyrights. So it's understandable to retract our work as being the standard procedure when a complaint was filed. But being called "plagiarism " is not accepted to the least possibility. We declared and listed detailed information about what's contained in messages. We will use our own manpower to reorganize translation starting from very beginning and represent it. Meanwhile we reserve our copyright in the last released language pack. Healthy community construction is beyond this unintended issue. So keep on working,do the right thing and put it behind. Last edited by ABCbarbecue; 10-26-2017 at 03:10 AM.